The Arnold Classic 2012 Results – and again Branch Warren champ! The second biggest bodybuilding competition in the world after the Olympia contest – Arnold Classic 2012 held this weekend in Columbus, OH. For the second year consecutively Branch Warren took main prize, a check in amount of $130,000 that was presented by Gerard Dente of MHP, a trophy presented by Tim Bentley of GNC, and a Tony Nowak Original jacket and congratulations from Arnold Schwarzenegger. Branch was also awarded as the Most Muscular Man Trophy and takes the $10,000 check for the Most Entertaining Posing. As many judge noticed his size was fantastic that is why just few competitors can compete with him. These are Dennis Wolf – he placed second receiving $75,000 check presented by Rich Gaspari of Gaspari Nutrition and an Arnold Classic medallion presented by Jay Jacobson of Optimum Nutrition and Evan Centopani – he was third awarded with $50,000 presented by Eric Schwartz of Animal Universal Nutrition and a medallion by Dean Donlon of Bodybuilding.com. The next three places were taken respectively: Ben Pakulski (Canada) – $30,000, Dexter Jackson (USA) – $15,000, Lionel Beyeke (France) – $10,000. 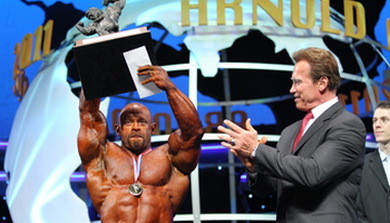 Read moreThe Arnold Classic 2012 Results – and again Branch Warren champ! Branch Warren is Back – Better Than Ever! Eight weeks before the 2012 Arnold Classic, George Farah provides some photos of Branch Warren who injured himself. In August Branch Warren slipped on a wet surface and injured his right quadriceps. This incident makes him to skip prestigious bodybuilding competition 2011 Mr Olympia held in September. At the moment Warren looked better and is … Read moreBranch Warren is Back – Better Than Ever! Branch Warren continues the dominance two weeks after winning the Arnold Classic with an impressive win here in England over Roelly Winklaar and Johnnie Jackson. A tremendous in shape Ronny Rockel was in 4th place, although many have said that he should of placed higher. In 2006, Branch Warren made his Arnold Classic debut with a stunning runnerup finish behind Dexter Jackson. He stumbled to seventh the next year, the rare occasion when he wasn’t on-point, but in the last three first weekend’s in March he’s been fourth, third and third again at the A.C. Having knocked on the door so many times, this year in Columbus the Bulldozer is looking to blow that door open. One thing is certain, as he does every March he’ll have the best pair of calves among the top contenders. As he preps for his sixth A.C. on March 5, we look back at how Branch Warren swelled his lower legs. Branch scores the big win at last! 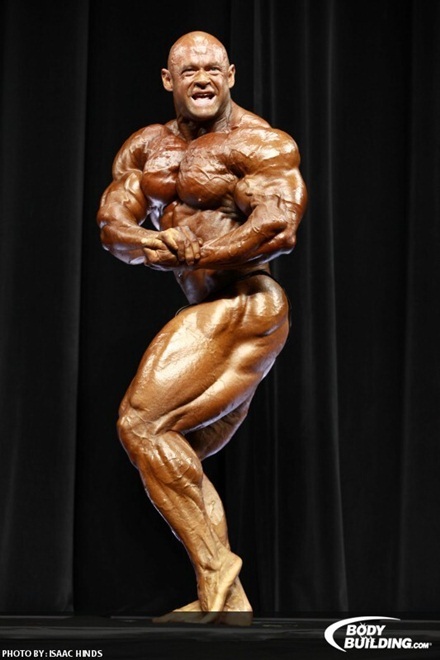 Despite very strong competition from both Dennis Wolf at his best ever and Victor Martinez in top condition, Branch Warren did indeed leave the Veteran’s Memorial Auditorium tonight not only with his fifth Most Muscular award, but also first place and all that goes with it: a $130,000 check, a $20,000 Audemars Piquet watch, a Tony Nowak leather jacket, and a Joska crystal trophy. He also now joins the list of legends that have won the Arnold Classic that includes Rich Gaspari, Shawn Ray, Kevin Levrone, Flex Wheeler, Ronnie Coleman, and Jay Cutler. After hearing his name announced by emcee Lonnie Teper as the winner, Branch dropped to the floor much the way Ronnie Coleman was known to do back in the day. Arnold came out to give the congratulatory interview, and commended Branch for refusing to give up even though he came up short at this event several times over the last four years. Branch took the time to thank his Lord and savior Jesus Christ, his wife Trish, his good friend Brian Dobson who believed in his potential twenty years ago when no one else did, and his sponsors: Steve Blechman and MD, Muscletech, and GASP clothing, and his nutrition coach George Farah. Coming off a 2009 2nd place Mr. Olympia finish, Branch Warren, one of bodybuilding’s toughest predators, is on the hunt. The “Quadrasaurus” is hungry, and he has his eye on the prey – a 2011 Arnold Classic title. Beware! In the world of professional bodybuilding, there have been many greats, many legends, but there have only been 12 men who have earned the title of Mr. Olympia. From the days of the first man to win the crown, the Legend, Larry Scott, to The Myth Sergio Oliva, to the man who propelled the sport to the mainstream Arnold Schwarzenegger, to Lee Haney and Dorian Yates, to the champions of this millennium, Ronnie Coleman and Jay Cutler, the title of Mr. Olympia has been worn with honor and dignity. As 2010 rolled around, the bodybuilding world was buzzed as the 45th anniversary of the contest was setting up as one of the biggest in history. Coming in, the experts weighing in claimed that the battle would be between The Gift, Phil Heath, and The Predator, Kai Greene.